I don’t think I need to comment on this picture. What else could I say so you’ll want to make this warm and nutty quinoa breakfast RIGHT NOW? I’ll just say these few words more. Red quinoa. Coconut milk. Cinnamon toasted nuts. Berries. Delicious… Your new breakfast favorite. Promise. 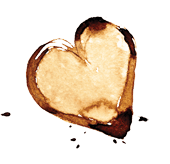 This recipe is inspired by a breakfast I had recently in Moab, Utah at a restaurant called The Love Muffin. 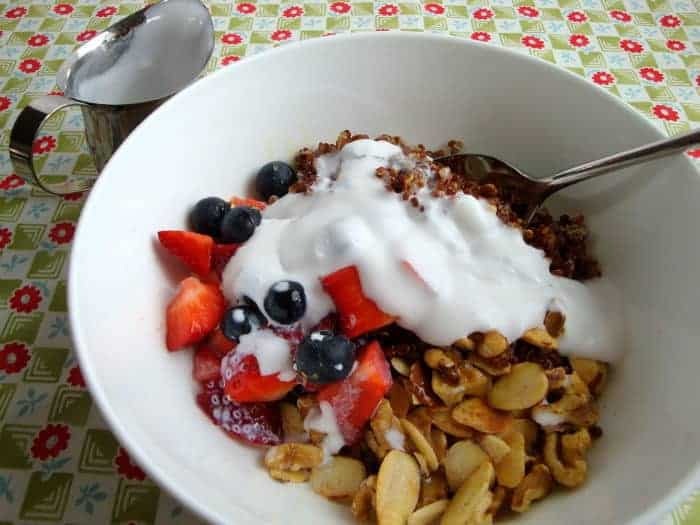 Decrease the amount of nuts and adjust your choice of milk if you’re worried about calories or fat. But remember, the fat content in this recipe is from healthy sources. Cook’s note: I regularly add chia seeds and flax to this dish. And if you’re in a hurry, skip toasting the nuts, but don’t forget to still add cinnamon. In medium sauce pan, bring quinoa and water to boil. Cover, reduce heat and simmer until water evaporates, approximately 15 minutes. Meanwhile, toast almonds and walnuts in small dry sauté pan until nice and golden but not burnt. Remove from heat and sprinkle with cinnamon. Pour coconut cream over the mixture and enjoy! 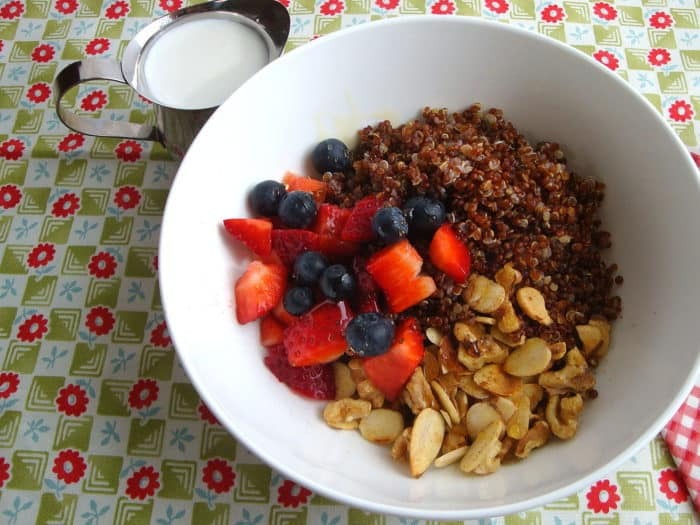 I’ve been thinking about using quinoa for breakfast and love this recipe! Fruit and nuts would be perfect additions. Abby, I eat this breakfast several times a week. Let me know what you think if you try it. Linda, thanks for your comment! 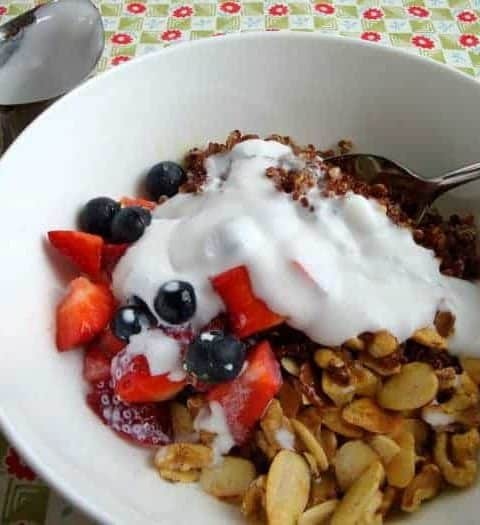 I used the canned coconut milk for this recipe and sometimes use coconut crème (if you can find it. I got mine at Trader Joe’s). The sugar content in true coconut milk and coconut crème is very low. When using coconut crème though, I put a little milk or almond milk with it because the crème is very thick. Yum! 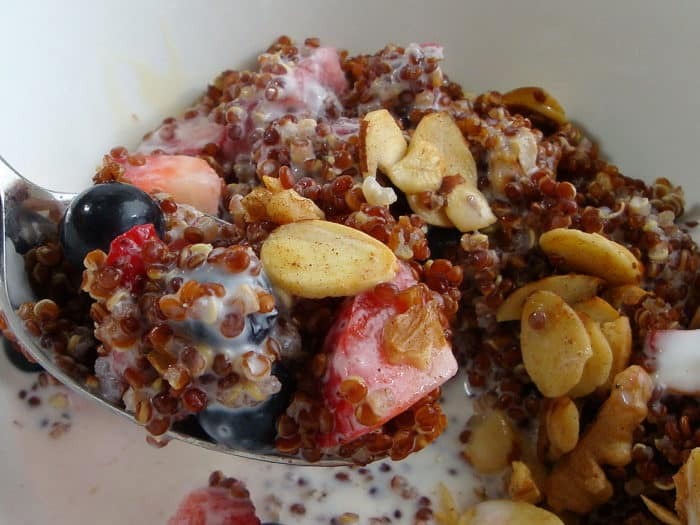 Love quinoa – never thought to use it like i would oatmeal. I am trying this! Leanne, I hope you like it. I love how easy it is to make and how filling it is. Thanks for your comment!